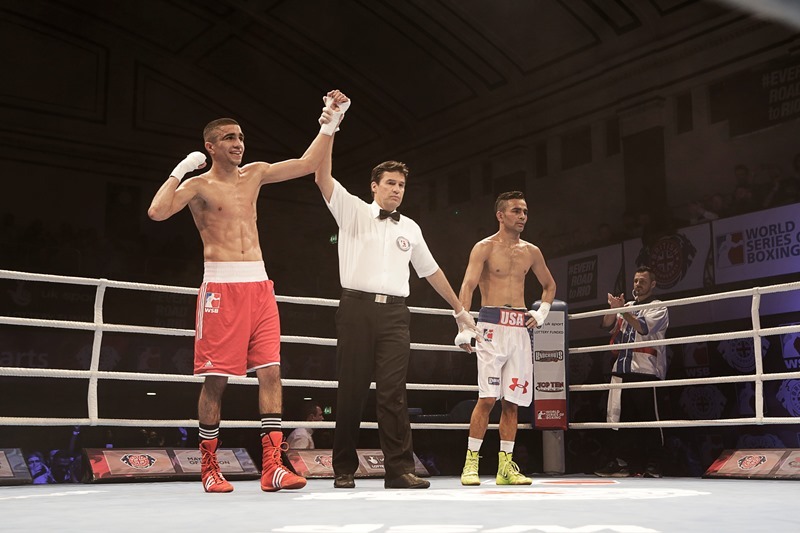 The British Lionhearts maintained the team’s unbeaten start to the season with a comprehensive 4-1 win over the USA Knockouts in front of a sold-out York Hall last night in the World Series of Boxing (WSB). Stoppages by Londoners, Joshua Buatsi and Joe Joyce, were the highlights of the night as the British team sealed the victory to maintain its position at the top of Group B and guarantee a place in the quarter-finals of the competition. The Lionhearts were given the best possible start to the evening in the flyweight bout where Muhammad Ali overwhelmed Gaurav Bidhuri from India, who was boxing for the USA team. Bidhuri could not live with the relentless work-rate and volume of punches thrown by Ali who won all five rounds on all three of the judges’ scorecards. WSB debutant, Cyrus Pattinson, was next up for the Lionhearts in the welterweight contest. The newcomer looked comfortable against the USA’s Bruce Carrington, until a heavy right hand by the American forced a standing count and opened a cut over Pattinson’s left eye. A second eight count in the third round saw the Lionhearts corner make the decision to withdraw Pattinson and ensure the cut did not get any worse. Next-up came the 2015 European Champion, Joe Cordina, who showed dazzling speed and footwork to secure a unanimous victory against the USA’s Bruce Carrington in the lightweight contest and put the Lionhearts into a 2-1 lead on the night. It fell to the local heroes Buatsi and Joyce to put the icing on the cake as the two Londoners delivered stunning victories and the loudest cheers of the night from a raucous home crowd. The light-heavyweight contest pitched Buatsi against the highly experienced Frenchman, Souliman Abdourachidov, who was boxing for the USA. A cagey opening round saw the pair weigh each other before Buatsi drew first blood in the second with a clubbing right that sent the Frenchman to the ropes. Abdourachidov recovered well and used all his experience to land a number of blows on the Lionhearts man, however Buatsi was not to be denied and ended the fight in the third round by TKO, after sending the Frenchman to the canvas with a thunderous right hand. More fireworks followed in the super-heavyweight contest where Joe Joyce dispensed with the USA’s Brandon Lynch within in a minute to seal the win and hand the Lionhearts a 4-1 victory on the night. A replay of the match can be watched on BoxNation (Sky 437/490HD, Virgin 525, Freeview 255, TalkTalk 415) at 4.30pm on Friday 4 March, 12.10pm on Saturday 5 March and 4.30pm on Sunday 6 March 2016. The next home match for the Lionhearts will be against the Morocco Atlas Lions on Thursday 17 March 2016 at York Hall in London (doors at 6.45pm, boxing from 8.00pm). Tickets are on sale now at tickets.sky.com/Boxing/World-Series-of-Boxing. More details on the Lionhearts and WSB are available at worldseriesboxing.com and by following the Lionhearts on twitter at @Brit_Lionhearts. BoxNation is available on Sky 437/490HD, Virgin 525, Freeview 255, TalkTalk 415. Subscribe at boxnation.com or watch online at watch.boxnation.com and via iPhone, iPad or Android and Amazon devices.